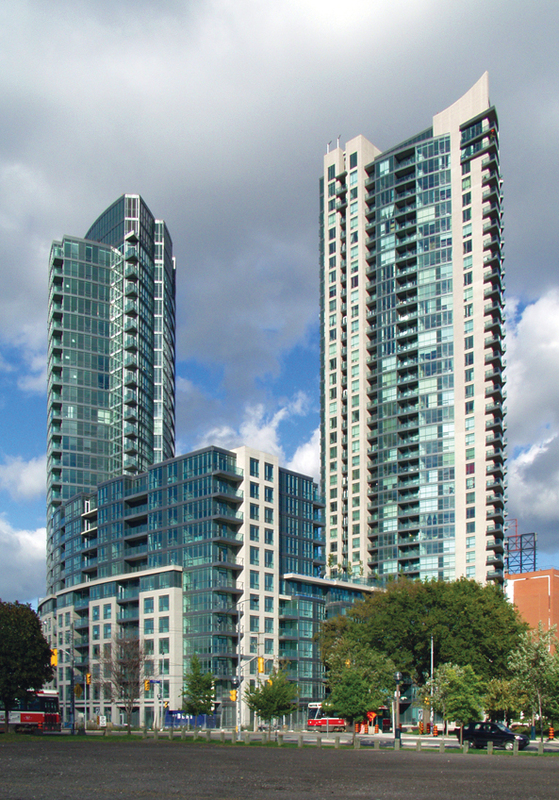 This thirty-nine storey residential condominium, tower, rising adjacent to a seven storey residential, podium, is located north of Fleet Street, south of the Gardiner Expressway, and east of Strachan Avenue, to the west of downtown Toronto. There are three levels of subgrade parking. The P3 level is a 100 mm thick slab-on-grade, with fibrillated polypropylene fibres to control shrinkage cracking. The P2 and P1 parking levels are framed, in general, as 200 mm thick, reinforced concrete, flat slabs, with 150 mm deep drop panels over the columns. Beyond the limits of the superstructure, the ground level slab is, for the most part, a 250 mm thick, reinforced concrete, flat slab, with 150 mm deep drop panels, and 300 mm deep capitals, over the columns below. Below the superstructure, the framing of the ground floor is, in general, a series of 200 mm thick, one-way, reinforced concrete slabs, spanning between reinforced concrete shear walls or onto reinforced concrete beams. The second floor slabs are typically one-way, reinforced concrete slabs, spanning 6.1 metres, between reinforced concrete shear walls, or 500 mm wide by 500 mm deep transfer beams, over the swimming and whirlpool area. The floor framing, for the third floor is the same as for the second floor, except that the transfer beams, above the amenities, in some instances are as much as 700 mm wide by 800 mm deep. Floors four through seven are similar to the third and second floors, except that there are no transfer beams. The eighth floor is, in part, the roof of the podium element. Within the tower, the framing is similar to the floors below. The ninth and tenth floors, of the tower, are similar to the tower floors below. Tower floors eleven through thirty-six are similar to the typical tower floors below, with, for the most part, 200 mm thick, one-way, reinforced concrete, slabs spanning between shear walls. The thirty-seventh floor is similar to the floors below, except that, at the north-east of the floor, the typically 200 mm thick floor slab is increased in thickness to 300 mm, and is two-way reinforced to act as a transfer slab to carry the loading from two new columns introduced above. The thirty-eighth floor is similar to the typical floors below, except that, the edge of the slab is drawn back 1500 mm, towards the center of the radius at the north-east of the floor.